FILE - A man walks in front of a public TV screen broadcasting news of North Korea's test-firing of its second intercontinental ballistic missile, in Tokyo, July 29, 2017. North Korea still lacks a key technology needed to deliver a nuclear weapon to the U.S. mainland, according to analysts, who nevertheless acknowledge the intercontinental ballistic missile that the North launched last week marked a significant milestone for Pyongyang's military program. The ICBM that North Korea test-fired late Friday night was the second long-range rocket it launched in July. 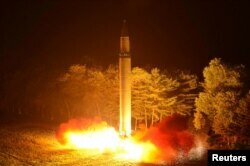 Defense officials in Washington and Seoul said the missile, known as the Hwasong-14, was launched out of the Mupyong-ni arms plant in the country's north and traveled about 1,000 kilometers laterally while reaching an altitude as high as 3,700 km. The missile was in flight for about 45 minutes before falling into the Sea of Japan, less than 175 km from Hokkaido, Japan's second-largest island. "I think we now see North Korea with a full-fledged ICBM," Jonathan McDowell, an astrophysicist at the Harvard-Smithsonian Center for Astrophysics, told VOA's Korean Service. "It seems to have worked as designed, and so that is a milestone in their missile development." 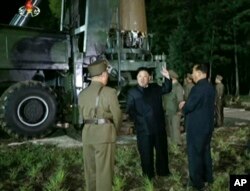 FILE - In this image made from video by North Korea's KRT on Friday, July 28, 2017, North Korean leader Kim Jung Un, center, gestures at the site of a missile test at an undisclosed location in North Korea. Had the rocket been fired into the atmosphere at a standard, lower-angle trajectory, McDowell said, its payload would have up to 11,000 km, a range that would put "all of the continental United States, except for Florida" within striking distance of the North. Based on an earlier test on July 4, the maximum range of Pyongyang's Hwasong-14 had been estimated at 7,000 to 8,000 km, or within reach of Alaska. Analysts continue to debate how Pyongyang achieved the improved performance. McDowell said it appears unlikely that the North might have reduced the weight of the missile's payload to lengthen its range — the lighter the payload, the farther the missile can travel. However, he suggested that higher-thrust engines powering the missile's second stage could have given it "a bit more push." Re-entry technologies are one of the biggest challenges to the Kim Jong Un regime's ballistic missile program, and many experts are doubtful that Kim's program has perfected that capability. For nuclear-tipped ICBMs to reach their targets, their payloads, or warheads, must weather the extreme heat and pressure generated while descending through Earth's atmosphere. Further doubts about North Korea's missile capabilities come from video by the Japanese public broadcaster NHK that showed the Hwasong-14's re-entry vehicle splashing into the sea off Hokkaido, and possibly disintegrating prematurely. Michael Elleman, a senior fellow for missile defense at The International Institute for Strategic Studies, said that during its descent from peak altitude, the North Koreans' re-entry vehicle appeared to shed small radiant objects that soon dimmed and disappeared, possibly indicating it was breaking apart. Skeptics, however, have suggested that the re-entry vehicle's breakup may have been due to the steep angle of the missile's ballistic trajectory, which would have increased its speed and consequently its surface heat. Manned capsules returning to Earth from orbital flight generally descend through the atmosphere at a fairly flat, low angle, even though they are equipped with advanced heat shields. "Had the RV survived the rigors of re-entry, it would have continued to glow until disappearing behind the mountains," Elleman wrote on 38 North, a North Korea monitoring website run by Johns Hopkins University's School of Advanced International Studies. FILE - Intercontinental ballistic missile (ICBM) Hwasong-14 is pictured during its second test-fire in this undated picture provided by KCNA in Pyongyang on July 29, 2017. "A reasonable conclusion, based on the video evidence, is that the Hwasong-14's re-entry vehicle did not survive during its second test," Elleman said. "If this assessment accurately reflects reality, North Korea's engineers have yet to master re-entry technologies and more work remains before Kim Jong Un has an ICBM capable of striking the American mainland." Despite North Korea's claims of a successful test-launch, Jang Young-geun, a professor at Korea Aerospace University, told VOA it cannot be assumed that Pyongyang has a reliable, long-range system until the regime provides data records that will validate the payload's intact re-entry and landing. The technology required is not simple, Jang said, noting that "re-entry technology is something the U.S. and Russia have studied for a long time." Whether or not last week's missile launch accomplished its goals, McDowell said it appears North Korea's continued missile tests will pave the way for deployment of a reliable, nuclear-capable ICBM capable of reaching the U.S. mainland within one to two years. "It's certainly true that the trajectory exposed the re-entry vehicle to the sort of conditions that an ICBM re-entry has to survive," McDowell said. "A couple years ago, we could say they have not tested re-entry vehicles in a reasonable environment to know that they are not ready yet. We can't say that anymore." Jenny Lee contributed to this report which was first published by VOA Korean.